For those of you who are new to my ruminations my maternal grandparents lived in an old, two-story farmhouse out in the countryside of southwestern Michigan. And the door that served as its primary entry opened directly into the kitchen. The kitchen was the central gathering place in the old house, with most activities focused on or around the table located in the center of the room. Repairs to radios and other household devices were typically done there (one could actually repair a radio back in those days) as were myriad other tasks requiring a flat surface and the aid of kibitzers, including the preparation of the family’s federal income tax return, as I recall. In earlier days one would have found a deep sink in there with a cast-iron hand pump that piped water in from a cistern outside. But by the time I was a teenager the room had been fully modernized with electric appliances. In the far corner of that room, though, one would have also found a tall, white, built-in cabinet with enclosed shelving below for pots and pans and glassed-in shelving above for dishes and knickknacks. And at waist height (which was about nose-height to me when I first discovered it), was a junk drawer. And a tiny hunting knife in a leather sheath. When I first spied that little knife, my eyes lit up like a Christmas tree. It was about four inches in length with an ivory-like handle and the name of a Kentucky campground or something imprinted on the leather sheath. A perfect replica of a buck knife, in miniature. Well, upon stumbling across this excellent find I decided to borrow it for a while. Fast forward to my house. My father was an industrial engineer by trade and, at the time, was in the process of building the first of three homes he would eventually construct for our family and my paternal grandparents over the next twenty years or so. And in the garage, he had a brand-new coil of about 100 feet of what would probably equate today to Romex 20-amp electric cable, which was to be installed in the new house. I had been particularly curious about this cable. I could see the three copper wires at the tip of each end but could not help but wonder what it looked like in the middle. Was it the same all through? So, I set to work with my little knife to find out. Interestingly, I don’t remember getting paddled for that first-of-many-to-come errors in judgment in my life. I could have just asked about it, I suppose—But I had been searching in earnest for something to use that knife on. Well, Dad ended up tossing out the whole cable since it could not be repaired in a manner suitable for its intended use. He did ask me though why, for crying out loud, did I have to cut it right smack in the middle? I patiently explained, as I have above, and then never saw that little knife again. It was the same in the middle by the way, in case you were wondering. I like this tale, Skip. I have my own such junk drawer with the same kind of stuff. More importantly so did my mom & dad. 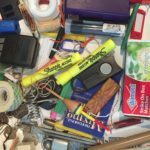 After they passed and I had to sell the house, that junk drawer was the most difficult to purge. So I took most of it home with me and added to my junk drawer.